Day 6 started with a drive back to Phoenix with Bill Bridwell, 2nd Vice Chairman of our AZGOP, to attend the memorial service at Best Funeral North Central Chapel for 1st Vice Chairman, John Rutledge, who passed away last Friday night. The chapel was filled with his family and many friends to say a last goodbye. John will be missed by all but not forgotten. Driving back to Florence, Bill Bridwell and I discussed the current political situation in Pinal County. Long a Democrat stronghold from early territorial days, things are a changing. Recent Democrat scandals have opened the door for Republican candidates. This will be the breakthrough election year for Republicans in Pinal County with possibly two supervisor positions and the Sheriff’s office turning red. The first time countywide offices will be won by Republicans! We also have three strong candidates for the legislature and expect to win seats for the first time in LD23. On the national level, the war between Russia and Georgia has reminded us all that the world is not a nice place. Peace has not broken out all over for the citizens of the world. Every time the Liberal left and the drive-by media think they are winning the war of words and ideas, something happens – oil prices skyrocket, wars not involving Americans break out and Obama takes a vacation at the wrong time. Enough said, Senator McCain will be our next President. 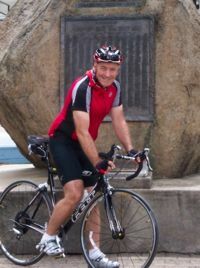 Arriving back at the hotel, I pulled on my Spandex, jumped on the bike and started pedaling. It was 12:15 pm, and I had 64.5 miles ahead of me to reach Tucson. It was already well into triple digit temperatures, and the first 36 miles is uphill. I set a slow pace of 12.5 mph, knowing it would be a long hot day – and it was. As you gain altitude and approach Oracle Junction, the desert is transformed into grasslands with flowering barrel cacti, sunflowers, wild daisies and many other flowers. The monsoon rains have brought renewed live and beauty to the high desert. At mile 35, it began to rain and it brought welcome relief from the heat as I cooled off and increased my speed. As we entered north Tucson, I began looking for our RV Park for the night. My original plan was to stay in southeast Tucson, but the change in schedule and late start necessitated a new location. Whipping out my Blackberry and opening up Google maps I punched in RV Park and several turned up within a couple of miles of our location at Oracle and Ina Roads. Driving by the first one, it seemed to be all mobile homes, the same with the second one. Then it dawned on me, I wanted a “travel park.” No problem, a quick change and Google identified 3 within 2 miles – all next to I-10. Love the sound of traffic? Pulling into the travel park at dusk, our neighbor came over to help us get hooked up. With no prompting, he volunteered he was supporting McCain. How could he know? Maybe it was the Republican banner on our RV. I gave him a McCain bumper sticker and thought, all is well in RV land. Today started out at 6 am with a 55 mile ride ahead – the shortest day yet. The ride from Wickenburg to Phoenix is essentially flat with a descent of almost 1,000 feet by the end of the ride. This makes for a fast ride until you reach Sun City West and begin to pick up heavy traffic as well as traffic lights. The ride is not especially hard; however, the triple digit temperatures require additional water stops. My route took me down Grand Avenue, through El Mirage, Surprise, Sun City, Glendale and Phoenix. Turning left on to Indian School Road and following it to 24th Street and then to Party headquarters one block north of Osborn Road. On reaching the office, I was greeted by our great volunteers and Party staff. After a short celebration everyone went back to work. With 83 days left before the November election, there is much to do. Having ridden 249 miles through northern and central Arizona, I am struck by what a beautiful state we have. At 15 mph, you have plenty of time to look around and enjoy the scenery. From the awesome Grand Canyon, and the beautiful Ponderosa Pine forests around Williams, to the green grasslands of Chino Valley that attracted cattlemen as early as the 1850s, then up to Prescott, the first territorial capital. The switchbacks down the rugged Bradshaw Mountains taking you through more cattle country on to Wickenburg, the home of the famous Vulture Mine. The climatic changes and accompanying diverse ecosystems make for great memories. Tomorrow, I will travel down the Indian Bend Wash bicycle trail though Scottsdale and Tempe and then on to Chandler, south and east on AZ 87 until I reach Florence. All together, about 62 miles. Today started as did day 1 with the inflation of both tires to the proper pressure. Shortly thereafter, I was on the road again. Today’s ride took me down I-40 at speeds as high as 40 miles an hour as I shed 1,900 feet of altitude from Williams to Ash Fork in 19 miles. As I shot down the Interstate to the hit tunes of Credence Clearwater Revival on my iPod, I was very aware of the smell of burning truck brakes as they shot by me at 80 miles an hour. The whoosh of the passing trucks physically moved me and my bike further to the right of the shoulder. The first half of 54 mile ride from Ash Fork to Prescott on Highway 89 was mostly downhill as I descended 900 feet before beginning to climb another 1,000 feet to Prescott. Along the way, I saw beautiful tall, green grass meadows mixed with red, yellow, purple and white hues of wild flowers. The roadside was covered with yellow sunflowers in full bloom. My iPod tunes were the rock hits of British crooners Phil Collins and Elton John. Arriving in Prescott at noon, I stopped by Kendall’s Famous Burgers and Ice Cream on Cortez Street to have a chocolate milk shake. While sitting on a bench under the awning in front of Kendall’s, an afternoon thunder storm burst upon us. After it let up, we headed across the street to the Prescott Courthouse for a few photos. Leaving the courthouse and riding out of town on AZ 89 heading toward the White Spar Campground, I heard my cell phone ringing. I pulled off the side of the road to answer it and my bike fell over, usually not a big deal, but it hit on the seat and broke it. Now riding a bike without a seat is possible but problematic at best. After 71 miles of riding I was not relishing finishing the last two miles standing up. After trying to fix it unsuccessfully, I looked up and saw I was standing in front of Ironclad Bicycles. I walked in with my broken seat and the owner, Jim Knaup, had a nice selection of Specialized brand seats from which to pick. With a new seat, I rode off to the campground as a new thunderstorm drenched me. Arriving at the campground, I was surprised to see it virtually empty. White Spar is a popular spot for Phoenicians to spend their weekends. No doubt, the high gas prices are keeping campers home. Thank you, Nancy Pelosi. For my bicycling friends, I have ridden 130 miles, averaging 14.5 miles an hour with an average cadence of 64 over two days. 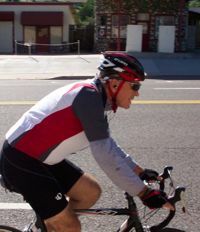 Tomorrow, Day 3, I will be descending over 4,000 feet down the Bradshaw Mountains to Wickenburg. The total distance traveled will be 57 miles, the shortest day so far. We arrived at the Grand Canyon campground last night at 6 pm where I donned my Spandex (much to the chagrin of my political director) and rode off to Mather Point on the shuttle bus to get a few photos with my bike at sundown. My travel partner for the first half of the ride is Brett Mecum, our AZGOP Political Director. He is taking the photos as well as driving the RV while I am pedaling. I think he has the best job. I’ll be glad to get out on the wide open road, because that’s how I see our future both in Arizona and nationally. If we elect more Republicans to the Arizona Legislature and Congress and have John McCain in the White House, America will be in great shape. The Victory Ride started off at 6 am this morning. After a light breakfast, I followed Barack Obama’s key energy directive and inflated my tires to the proper pressure. No doubt, great advice for my bike, but not so good for American energy independence. So the journey began. The first leg of the trip to Williams is 60 miles. My recollection from having driven the route is it was moderate hills at both ends with flats in the middle. I can now say authoritatively it is much more uphill. The last 20 miles were almost all uphill. 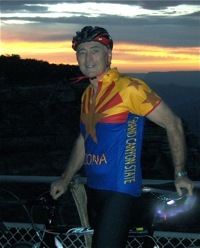 About half way through the morning ride, I received a phone call from Leo Mahoney informing me that John Rutledge, AZGOP 1st Vice Chair had passed away on Friday night from heart failure. He had been hospitalized earlier in the week due to a fall and a nasty head wound. This was sad news and I stopped the ride to make a few phone calls and issue a press release. It certainly is fortuitous we are in an RV with computers and wireless. John and I had become good friends over the past five years and I appreciated his advice. I will miss him. We are traveling in a Fleetwood Storm RV (AZGOP Mobile HQ). I am making all kinds of new friends and handing out McCain bumper stickers and buttons at RV Park events. If I were to take a poll at the Williams RV park we are at today, it would be Senator McCain by 30 points. Love those freedom-loving RVers. Several thousand dollars have already been pledged on our website for “Victory Ride 2008.” You can still take part in this historic event by and making a pledge today. Tomorrow, the second leg of the ride will start from Williams and travel 19 miles to Ash Fork on I-40. At Ash Fork, I will take AZ 89 to Prescott. The total distance is 69 miles. I plan to arrive in Prescott at around noon where I will drop by Yavapai Republican HQ. After which I will ride to the White Spar Camp Grounds. Most of this ride will be downhill – lucky me. I hope to blog each day, and if you’re reading this and want to join me for part of the route please let me know at rpullen@azgop.org. Besides the Grand Canyon and Williams, I’ll be stopping in Ashfork, Prescott, Wickenburg, Phoenix, Chandler, Florence, Oracle Junction, Tucson, Sonoita, Sierra Vista and concluding in Tombstone on August 16th. Do we seat the delegates or not? Other than who will be the nominee, this seems to be the big question for the members of the DNC. The fact of the matter is that what the Democrats have right now with regard to seating of delegates from Michigan and Florida is a disaster. It gets worse, because the DNC is not only refusing to seat all of their delegates, but actually opposed their candidates being on their ballots or campaigning in either state. The Party, which tries to cloak itself in inclusionary politic, has essentially excluded all of the voters in these two states from the primary process. So much for fairness. But then, Democrats never really have been about fairness, it is and always has always been about wielding power over your life and mine. In an effort to avoid future issues on our side, the RNC Rules Committee has gathered here in Albuquerque, New Mexico at the annual Chairman's meeting to present and debate various ideas and plans for reforming the Presidential nominating schedule for 2012. One of the key goals is to avoid a national primary day. Frankly, a national primary would prevent many candidates who have great ideas from participating in the race. Reason being, a national primary would limit candidates to those who have massive amounts of money to fund a national campaign. For example, candidates such as Duncan Hunter, Tom Tancredo, Tommy Thompson and even Mike Huckabee would probably not have been competitive in a national primary. The RNC Rules Committee reported out yesterday the Ohio Plan for the 2012 Republican Primary process by a vote of 28-12. The Ohio Plan, promoted by Chairman Bob Bennett of Ohio, would create five groups, or as they are referred to "pods". The first pod would consist of four states, Iowa, New Hampshire, Nevada and South Carolina, which would go first in a three week window followed by a second pod of 19 small-population states and territories that would vote in the next three week window. The remaining three pods consist of the large-population states. These pods would have roughly similar allocations of electoral votes, and would rotate their order in the nominating process every four years. Pod X going in the next three week window, followed by pods Y and Z in the subsequent two week windows. Finally, the penalty of 50% of a state’s delegates at the National Convention remains in effect if a state moves its primary ahead of the designated window as outlined in the Ohio Plan. Conversely, there is no penalty if a state holds its primary later than the Ohio plan asks. Arizona is placed in pod Y along with California, Washington, Indiana, Tennessee, Virginia, North Carolina, New Jersey and Massachusetts. Under this plan, Arizona will never be among the first states voting. Many of the large states in the three pods voting in the later primary windows are not happy with this plan. There is every indication that the Ohio Plan likely will be opposed by large states with enough delegates to prevent its passage at the National Convention, unless it is substantially modified in the next RNC Rules Committee meeting in late August. Larger states want an opportunity to go earlier in the process. As your chairman, I agree with these larger states. Under the Ohio Plan, there would always be at least 23 states and territories voting before our pod of states, diminishing the importance of our primary. There is some indication that the five states that voted early in our primary process this year and were penalized with losing half their national delegates and alternates may in fact have their full delegations seated at the national convention. There are good arguments on both sides of this issue. As it becomes clearer as to what may happen, I will keep you informed and try to explain the implications for future presidential primaries. Thanks for spending a few minutes reading my update from the state chairman’s meeting. Look for a full debrief in next week’s, Tusk Times. I will be sharing more insight as to what we discussed as Party leaders here in Albuquerque. It's cloudy and 35 degrees right now in our nation's capital. Garrett and I are here and just finished up a two day, in-depth intensive training on the Republican National Committee's Voter Vault 3 system. All I can say is: What an amazing product! With Voter Vault 3, you as a PC, party activist, county chairman, candidate, or campaign manager can create walk lists, generate walking maps, target voters, develop mail and phone lists, tag voters based on issue, and much, much more. As party building and campaigns are an ever evolving process, Voter Vault 3 has become an essential tool for anyone involved in the Republican Party. What's more is that Voter Vault 3 is eons ahead of anything the Democrats have. Now that Garrett and I are fully trained on this revolutionary system, we will be scheduling Voter Vault training sessions throughout the state in the very near future. If you are a PC, party leader, or candidate and have not yet requested access to Voter Vault 3, e-mail either Garrett or myself at garcher@azgop.org or bmecum@azgop.org and we will get you the Voter Vault 3 Access Agreement. Garrett and I are now on to the RNC's New Media Training School, we'll give you an update on the new technologies available to get our message out tomorrow. And we are also looking forward to leaving the cold Mid-Atlantic and getting back home to sunny Arizona.